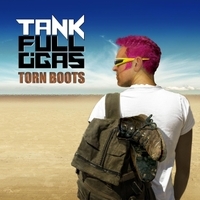 Here we find rocking duo TANK FULL O'GAS who have a new twelve track CD out now called 'Custom Bike in a Desert' that runs in at just over an hour minutes long. The album is has a strong organic/Americana feel with a classic seventies rock vibe, the songs are laid back and addictive and the playing from the guys is superb, silky, melodic and affectionate. Each song stands on its own merit and it is a listening album, there is a lot going on musically and with lyrics of a personal nature you know that this album is one of those that has a lot to say.